Animal Planet released the starting line up revealing twenty impressive pups. I’ve studied the line up hard, literally staring at some of these puppies for hours. Fantasy Puppy Bowl nerds get your pencils out; here’s my inside scoop on who’s going to make a splash in Puppy Bowl VIII. Everyone’s worried about the wild pack from Philadelphia this year. Being called the Philadelphia 4, you have Malie, Lucie, Hollie and Brandy all representing the City of Brotherly Love. The crew of collies, pit bulls and mixes have a very tight friendship. Will this be their downfall? I am worried the four will spend too much time wrestling with each other and not enough time getting the ball to the end zone. The inspirational story of the year goes to Baskin the pug and Jack Russell terrier mix. Although Jack Russells often perform well in sporting events, pugs are not known for their athletic ability. Being last picked in school never got in Basin’s way of chasing his dream. Pugs and Jack Russells everywhere will surely be cheering for him. Look for his uplifting life story in theaters next fall. Picking a Puppy Bowl MVP is never easy. Last year, proving size doesn’t matter, C.B. took the award home. This year I believe it will be a return to brawn. My money is on Hunter the boxer from Ohio. You can see in his eyes the determination to be a legend. MVP recognition wouldn’t hurt his future political career either. 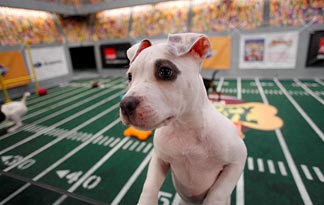 Sadly this year there will be no Austin athletes competing in the Puppy Bowl. Austin has a strong puppy scene and hopefully we will see one of our athletes competiting in the future. There are plenty of local organizations that support puppies that you can make a donation to. You never know, next year one of their pups could be MVP. Check out the action at last year's game in video below.